The object here was to get the thing spinning so fast that kids began flying off, one by one. The last one holding on for dear life was the “winner.” And to really test your mettle, you didn’t sit placidly in one of the “slots”—you stood up, or climbed astride the bars, or assumed some other death-defying position. Whether you call them see-saws or teeter-totters, they just don’t make ‘em like they used to. The ones at my elementary school and neighborhood park were wooden, with splinters and chipped paint. They were also pretty tall, and installed on blacktop. A girl in my second grade class broke her collarbone when her fellow teeterer pulled the old “I’ll get off of my side while you’re up in the air” trick. 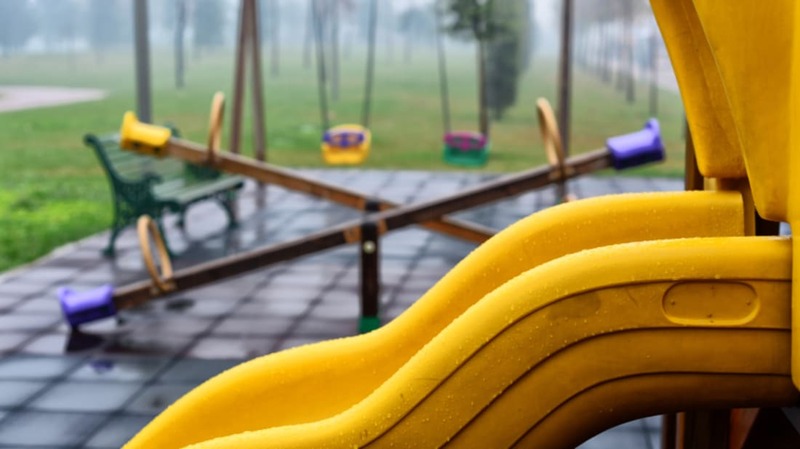 Those towering metal slides of yesteryear are being replaced with molded plastic models, and in order to conform to Consumer Product Safety Commission standards, the height and slope of those slides are far more restrictive. There was nothing quite like scooting down a metal slide in a skirt or pair of shorts after it had been baking in the hot sun all day. The sharp metal edges sometimes nicked you in a tender area when the surface seams began to separate, and since there were virtually no protective side rails, it wasn’t too difficult to accidentally flip over the side on your way down (say, if the heel of your sneaker accidentally caught and tossed you like a car skidding on the ice). Savvy kids brought a length of wax paper with them from home to sit on for extra-fast descents. Yet another piece of equipment that taught us Fun With G-Forces. Kids gathered around the outside of the ring and grasped it. Then they ran around and around, faster and faster, until the thing spun so fast your body was lifted off of the ground and you were (hopefully) flying almost horizontally. It was all good, clean fun—until someone barfed. Swing seats today must be made of vandal-proof rubber or some similar protectively coated material. It’s hard to find those thick steel or wooden seats that chipped many a tooth when they were thrown just so. The chains no longer have open S loops, and are quite often coated in vinyl … no more going home with orange palms from grasping rusty chains. And the swingsets aren’t nearly as tall, which takes a lot of the fun out of jumping from the seat when you’re at the highest point in your arc. Similar to the Witch’s Hat, but with individual hanging pieces, so that the slower kids got rammed into, or perhaps smashed into, the center pole. At my school the horizontal ladder was made of metal and perched over asphalt. Blistered hands were the natural result of crossing, especially in warm weather. When the safety monitor wasn’t looking, we engaged in “dog fights”—one person started from each end, met near the middle, and kicked and flailed their feet, trying to knock each other off the bars. Truly adventurous kids climbed on the inside of this structure, so that they were upside-down at the top, then continued that way to end up head-first on the other side. And when the bell rang to signal the end of recess, if you happened to be on or near the top, you saved time by simply jumping down to the ground. Because only wussies bothered to carefully climb down when time was of the essence. Thanks to the danger of getting smacked in the face, plus the steady stream of broken/jammed fingers as a result of kids hitting the pole instead of the ball, this game is slowly becoming extinct on public playgrounds. Metal rings hanging on long chains are also now considered a safety hazard. Maybe that’s partly because kids used to do things like sit on top of the ring and swing and bash into one another, or hang upside down from their feet. Or whatever they’re properly called. Today they’re all lightweight plastic with coated springs. But the real deal was made of solid steel, as was the coil beneath it. Heavy duty fun for all! Please share your fondest playground memories: broken bones, sprained fingers and all!